Seven Floors High is based around a true story of life inside Iaxis, a London based Internet start-up company during the "dot.com" boom of 2000. Written with style and humor, the story is a personal account of one individual who saw the "paper tiger" from the inside. Woven through the main plot is a very powerful Non-Fiction sub-theme describing with detailed insight and analysis, several covert intelligence operations carried out by the US National Security Agency and the Central Intelligence Agency. This intelligence sub-theme scrutinizes the build up to the Iraqi invasion of Kuwait in 1990 and also details several other covert operations from recent history. Iaxis was located in London's ITN Building and its story provides a very timely insight in to corporate greed and commercial excess. Iaxis was born out of Kevin Maxwell's Telemonde company in January 1999 and following the rise of "dot.com" shares, Iaxis was valued at $1 Billion in March 2000. An offer to buy the company for $670 Million in April 2000 was turned down by the Iaxis board. 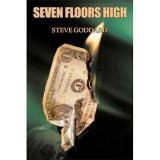 Seven Floors High is a vivid and humorous account of life inside Iaxis during this extravagant period. A "Secret Narrator" within the text also provides the reader with a detailed insight into both the classified world of intelligence gathering operations and the politics of oil as the life blood of the global economy. How much do we really know about the US National Security Agency's ECHELON system? What was the role of the US Department of Defense in the development of the Internet? How did America's National Security Directive 26 change US foreign policy towards Iraq in 1990? And how does this new information all tie-in with a story set in a London based start-up Telecoms/Internet company called Iaxis?